Elephant Cobra Lily is an interesting species of Cobra Lily found in China, Bhutan and Myanmar. We found it growing in Arunachal Pradesh too. 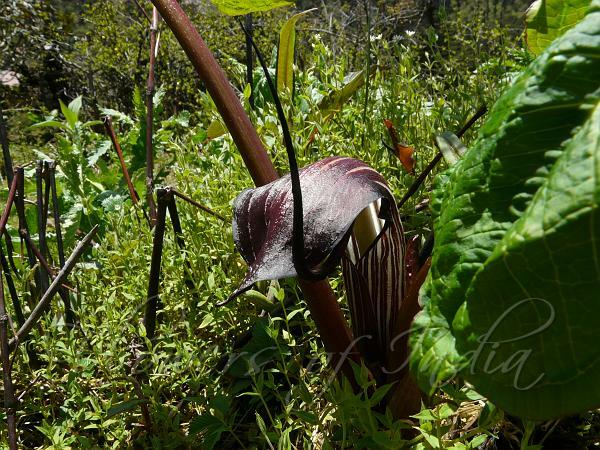 The "hood" or the spathe is purple, with white or greenish vertical stripes, carried on a leafless stalk 11-15 cm long. The "tongue of the cobra", or the spadix, is purple, and protrudes erect above the hood. The plant has only one trifoliate leaf, carried on a 20-30 cm long green stalk, which has 2 cm thick base. Leaflets are green - central leaflet is obovate to inverted heart-shaped, stalkless, 5-10 cm long, 6-13 cm wide. Lateral leaflets are oblique oblong or ovate, 7-14 cm long, 5-10 cm wide, pointed, base broadly wedge-shaped. 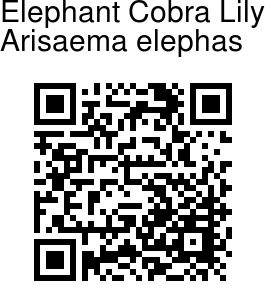 Elephant Cobra Lily is found in meadows, mossy rocks, at altitudes of 1800-4000 m. Flowering: June-July. Photographed in Tawang district, Arunachal Pradesh.